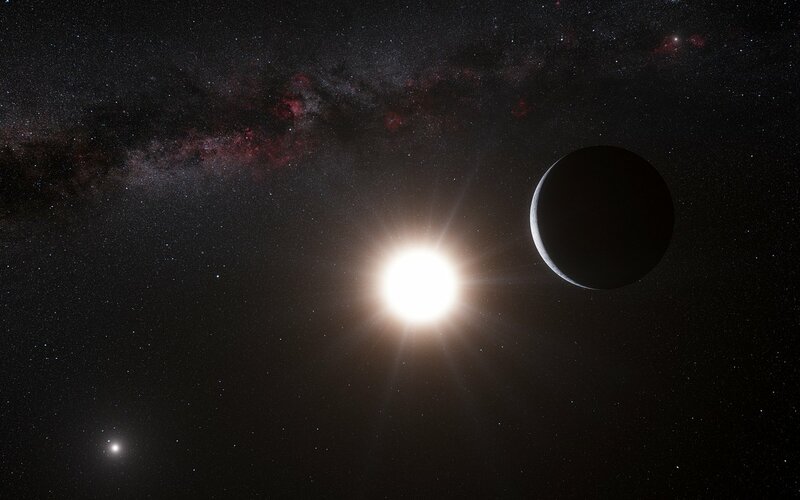 Alpha Centauri is a triple-star system, composed of a binary star, two stars much like the Sun – one slightly larger and hotter, called Alpha Centauri A, and the other slightly smaller and cooler, called Alpha Centauri B – orbited themselves by a red dwarf (called Proxima Centauri) much farther out. The planet orbits close in to Alpha Cen B, and is technically called Alpha Centauri Bb – planets have lower case letters assigned to them, starting at b. Its mass is only 1.13 times the Earth’s mass, making this one of the lower mass planets yet found! But don’t get your hopes up of visiting it – its period is only 3.24 days, meaning it must be only about 6 million kilometers (less than 4 million miles) from its star. Even though Alpha Cen B is a bit cooler than the Sun, this still means the planet is baking hot, far too hot to sustain any kind of life as we know it, or even liquid water. Still. Holy crap! A planet for Alpha Cen. Wow. The reason this is a big deal is twofold. 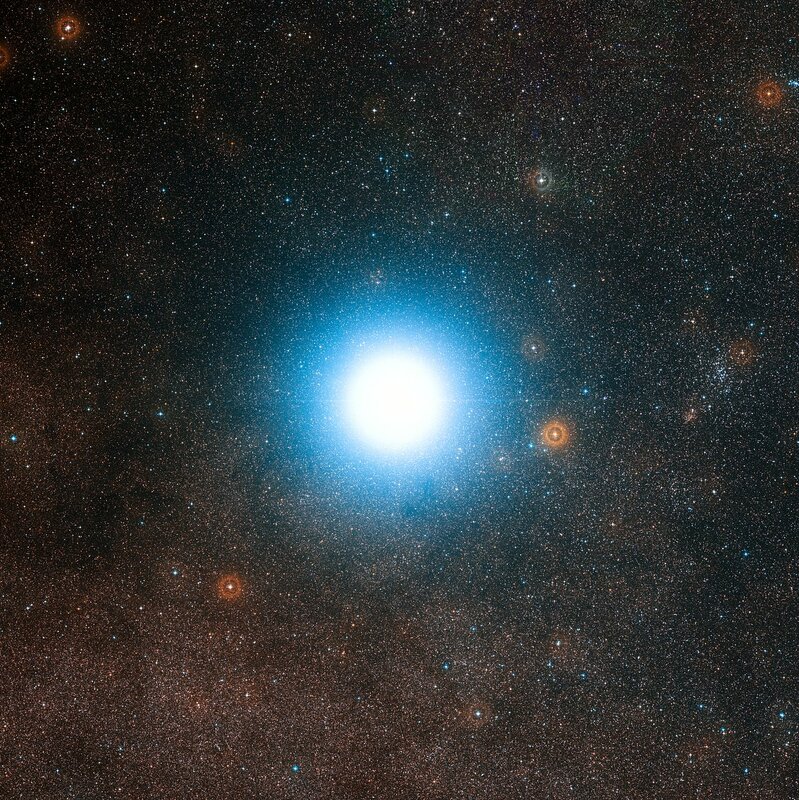 For one, Alpha Cen is the closest star system in the sky. Because of that it’s very bright, and well studied. Planets searches have looked there for decades, and in fact for a while it was thought the dinky red dwarf Proxima might have a planet. Those earlier findings have been shown to be wrong, though. If it has a planet, it’s too small or too far out from the star (or both) to detect it easily. The other reason this is important is that the signal from the planet is incredibly weak. It was found through its gravity. As it orbits Alpha Cen B, the planet tugs on the star, like two children holding hands and swinging each other around. This sets up a very small but detectable Doppler shift in the starlight. The more massive the planet is, the harder it tugs on the star, and the bigger the signal (making it easier to detect). Also, the closer in a planet is, the larger the signal is… and you get the added benefit of a short orbital period, so you don’t have to observe as long to see the cycle of the Doppler shift. In this case, the planet is low mass but very close in. The Doppler shift in the starlight amounts to a mere half meter per second – slower than walking speed! When I read that I was stunned; that low of a signal is incredibly hard to detect. Heck, the star’s rotation is three times that big. But looking at the paper, it’s pretty convincing. They did a fantastic job teasing that out of the noise. The graph displayed shows the effect of the planet on the star. RV means "radial velocity", the speed toward and away from us as the star gets tugged by the planet. The x-axis is time, measured in units of the period of the planet (in other words, where it reads as 1 that means 3.24 days). The dots look like they’re just scattered around, but when you average them together – say, taking all the dots in a one hour time period – you get the red dots shown (the vertical lines are the error bars). The signal then pops right out, and you can see the tell-tale sine wave of a planet pulling its star. This is incredibly exciting to me! A few years ago, when I worked on Hubble, I looked into using it to search for planets around Alpha Cen. I worked out some simulations to see if we could detect anything, and at best we could see a Jupiter-sized planet orbiting far enough out that its faint light wouldn’t be blasted out by the star itself. It was deemed too risky an observation (too low a chance of payoff) so we didn’t get time on the telescope to make it. We’d never have seen this planet anyway; looking for a planet reflecting its star’s light is very different than looking for the Doppler shift. Obviously! Also, c’mon. This is Alpha Centauri! Famed and fabled in a thousand science fiction stories. It’s where the Robinson family was supposed to go in "Lost in Space". It’s where Zefram Cochrane lived in "Star Trek". It’s where the Fithp came from in Footfall. Because the system is bright and close, and the stars so close to being like our own Sun, they’re an obvious place to put aliens. Plus, you get the exotic locale of a binary star plus the red dwarf thrown in on top. It’s perfect! So I, and a lot of people like me, grew up hoping against hope we’d find a planet around one of these stars someday. My very, very sincere and gracious thanks to the team that made these observations. Even if this planet is cooked to within an inch of its life, this is still literally a fantasy come true. And it reinforces my own thinking that we are very close to finding a planet with the same mass as Earth at just the right distance from its star to have liquid water, and therefore, potentially life. We are finding planets the right mass but at the wrong place, and at the right place but with the wrong mass. But we’re zeroing in on Terra Nova, folks, and statistically speaking there should be millions of them in the galaxy. It’s only a matter of time before we find the first one. – A nearby star may have more planets than we do!